Harvard’s troubled Motorola Plant site is now in forfeit on the orders of the U.S. Department of Justice, pending resolution of Edward Harvard Holdings LLC owner Xiao Hua Gong’s case initiated by the Ontario Securities Commission for allegedly selling fraudulent asset outlay accounts to individuals in China while acting in a broker capacity for two companies. Charges were filed in January, but the property was flagged last month by the federal agency. The matter came to light Oct. 29, when the property was set for a tax sale as Gong had failed to pay either installment of the site’s 2018 property tax assessment totaling $352,472.53, and inclusive of $17,581 in penalty costs. He was due to pay the taxes no later than Oct. 26, or have the amount purchased by a third-party lienholder. McHenry County Treasurer Glenda Miller halted the sale. “At the start of October, the U.S. Department of Justice filed a Canadian restraining order on the parcels, as well as a Lis Pendens, which they filed with the McHenry County Recorder’s Office,” said Miller. “It flagged the parcels, and they are now in forfeit, so they won’t be sold to a tax buyer.” Lis Pendens is a Latin term meaning “pending litigation,” usually pertaining to real estate or property. County records showed parcel #012510018 containing the property and buildings owed the $324,472.53 and another parcel #0125376003 owing $1,386.69 plus penalty costs. Gong purchased the vacant 325-acre site with four main structures, and a heliport, for $9.3 million through the Michigan-based Edward Harvard Holdings LLC, during an online auction conducted by TenX.com in 2014. Motorola constructed and opened the site in 1997, but closed the campus amid mounting financial debts in 2003. Gong had proposed a site use of manufacturing smartphones, and creating more than 200 jobs. 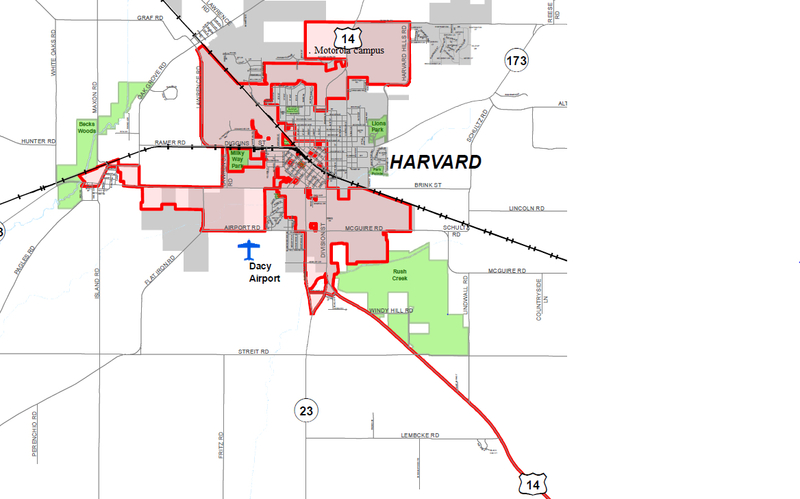 Approval of an application with the then newly created Harvard-Woodstock-McHenry County Enterprise Zone could have netted almost $32 million in tax and business for the company. The state legislature established the program in 1982 with enforcement through the Illinois Department of Revenue. It was designed to jumpstart growth in economically depressed areas through assistance to businesses by qualifying them for possible local and state tax incentives. The Motorola campus is a target site for Harvard. 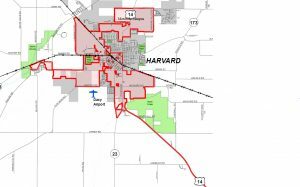 “He is in no position for tax incentives, such as equipment purchases, as it has to be an operating business and investing money back into the property,” said Harvard City Administrator David Nelson. “He paid his 2017 property taxes, which were in arrears at one point … but now 2018 taxes are outstanding. Gong had failed to pay the second installment of $162,718.50 on the 2017 annual property tax bill, due Sept. 9, and were subsequently purchased at the Oct. 30 auction. Records show the taxes and recovery fees were paid Dec. 18 to the county clerk. Gong was arrested in Toronto Dec. 28, with the OSC alleging that he had sold hundreds of millions of dollars in securities as the representative for O24 Pharma PLC and Canadian National TV Inc. to citizens in the People’s Republic of China. Based out of the Toronto area, Gong allegedly controlled both companies. “Significant” amounts were forwarded to Gong’s bank Canadian accounts, used for personal benefit and gain. Gong was charged under the Criminal Code of Canada, after an investigation by the OSC’s investigative branch, with offenses occurring between Jan. 1, 2012 until Dec. 20, 2017. He has been charged with one count of fraud over $5,000, one count of possession of property obtained by crime, one count of laundering proceeds of crime, and one count of uttering a forged document. The vacant Harvard property has seen attempts at reinvention fail in the past. One year after closing in 2003, the site was touted for a proposed water park that never materialized. Florida-based Optima, Inc. bought the parcel for $16.75 million in 2008, and was also unable to fund its property tax bill. Gong’s 2014 purchase brought renewed hopes for revitalization. “There’s a house on the property there, and as a little girl, our family lived there,” said Miller. “My father was a general contractor, and we lived in that house, surrounded by farms and the rural atmosphere, while he was building our house. I live around there and see it, and the site, almost every day.